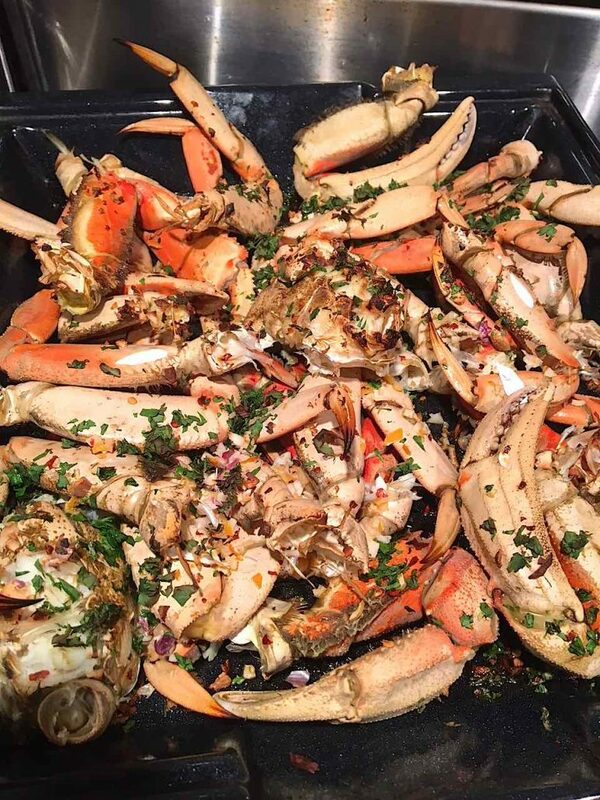 You are here: Home / Indulge - recipes and cooking advice for date night or any night / Aphrodisiac Recipes / easy / Easy Oven Roasted Dungeness Crab–because it’s crab season! Leanne’s husband, Brian, is an avid fisherman and hunter so there is always something good in her kitchen from the land or sea. She is a magnificent chef, having cooked on board yachts around the world for years. I always say…give her four ingredients and she can make a three-course meal. She’s a culinary genius. Crab in this household is not just boiled or steamed. It may start steamed but then Leanne tosses it in aphrodisiacs including fresh garlic, chili flakes, Italian parsley, preserved lemons (or fresh) butter and olive oil. Then she sprinkles it with more parsley and garlic on top and throws it in the oven to bake for about 20 minutes at 350 degrees. Is there anything sexier to eat than fresh crab? Cracking it and tearing it apart with your hands, then stabbing it with the little seafood skewer or simply prying it out of its shell with your fingers. It’s messy, delicious and always memorable. This Oven Roasted Dungeness Crab preparation doesn’t even call for clarified butter in which to dip the crab flesh but plan on many napkins! Once you try your crabs oven roasted, you'll never boil them again! Combine the butter and olive oil in a small dish. Add half the garlic, half the parsley, the chili flakes and lemon juice. Put the crab (or crabs) on a sheet pan and coat with the butter and olive oil mixture. Top with the remaining garlic and parsley. Cook for 16-22 minutes. (The cooking time will vary slightly based on how many crabs you’re cooking. For 1-2 crabs, check for doneness after 16 minutes. Plan on one 2-pound(ish) Dungeness crab for each diner as a main course. Half a crab per person works as an appetizer. However, if you're feeding a crowd, you may want to roast a few extra crabs as these crabs are hard to resist! https://www.eatsomethingsexy.com/wp-content/uploads/2017/11/easy-oven-roasted-dungeness-crab.jpg 1280 960 Barbara Barrielle https://www.eatsomethingsexy.com/wp-content/uploads/2017/01/Amy-Reileys.png Barbara Barrielle2017-11-22 12:00:512018-10-03 14:04:29Easy Oven Roasted Dungeness Crab--because it's crab season!